Why America’s campuses are going gray : Top College Degrees – resources and news on degrees, financial aid, and more! Dorms are filling up, classes are starting, and Frisbees are flying above quads at colleges and universities across the country. But these familiar seasonal patterns don’t reflect how a growing number of students are starting the year. More and more older Americans are heading back to school, often part time or in the evenings, and their rate of enrollment is rising faster than students of typical college age. In 2009, students aged 25 and older accounted for roughly 40 percent of all college and graduate students, according to the National Center for Education Statistics. That figure is expected to rise to 43 percent by 2020 as 9.6 million older students head to campus. Students over age 35, who accounted for 17 percent of all college and graduate students in 2009, are expected to comprise 19 percent of that total by 2020. “Older workers are seeing this sort of as a gateway to create a lifestyle later in life that they want,” said Cyndi Hutchins, director of financial gerontology at Bank of America Merrill Lynch. There are several reasons for the rise in older students. First, a significant number of retirees find themselves out of the workforce earlier than they expect. A survey last year by PNC Financial Services found that for retirees aged 70 or older, some 58 percent retired before they planned to do so. Some of those people may not want to be retired, but they need to sharpen their skill set to land a new job. “From a personal standpoint, some individuals have a hard time making that transition,” said Joe Jennings, investment director at PNC Wealth Management. In some cases, older students are developing skills and expertise in order to launch a second career, or to take their career in a slightly new direction. In a survey earlier this year by Merrill Lynch and Age Wave, 72 percent of the respondents aged 50 and over who were not yet retired said they envisioned working in some capacity in retirement. Often, it was in a new field. Whatever their reasons for returning to school, older students face different calculations when deciding how to pay for their education and what they can afford. “If you are talking about changing careers and going to back to school to change careers, you have to run the numbers on it and determine the break-even point—how many years would it take you to get ahead compared to if you stay in your career,” Jennings said. For people leaving the workforce to attend school, that calculation needs to include the income they will forego in addition to the direct tuition costs. But not all the calculations are financial. 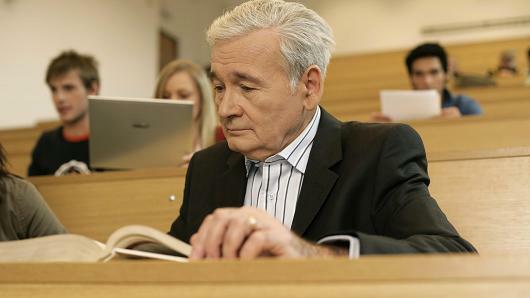 For some older workers, returning to school is intended to enable them to pursue work that is fulfilling in nonfinancial ways. For those people, the calculations are more about what they can afford. There are a number of financing and saving options for older students. Rich Polimeni, director of education saving programs at Bank of America Merrill Lynch, points out that 529 savings plans are for students of all ages. The contributions are even deductible from state taxes in over 20 states. Older students can also use any money remaining in children’s 529 plans after they are finished with school, he said. For people who are staying in their jobs and attending school part time, employers often have tuition assistance programs. Some lucky students may even get their full costs covered. Older students may also have accumulated savings they can tap for school. And there are plenty of scholarships that are not based on financial need, and even some geared toward older students, at sites like studentscholarshipsearch.com. There is no age limit on applying for financial aid, so would be students can certainly complete the Free Application for Federal Student Aid when they apply. Tax credits like the Lifetime Learning Credit can also help if an older student meets the income requirements. As a last resort, older students can take out loans, although the time horizon for repayment should be much shorter. There is nothing to be gained from carrying student loans into retirement. That said, federal Stafford loans may offer terms that are more favorable than private loans, and a nondependent student can borrow up to $12,500 for college and $20,500 for graduate school. For older adults who can afford to return to school, it can be a great way to stay young.